A forest fire rages in the Washington County town of Columbia Falls on Thursday. A combination of windy and dry conditions are partly to blame for nearly half a dozen wildfires across the state on Friday. 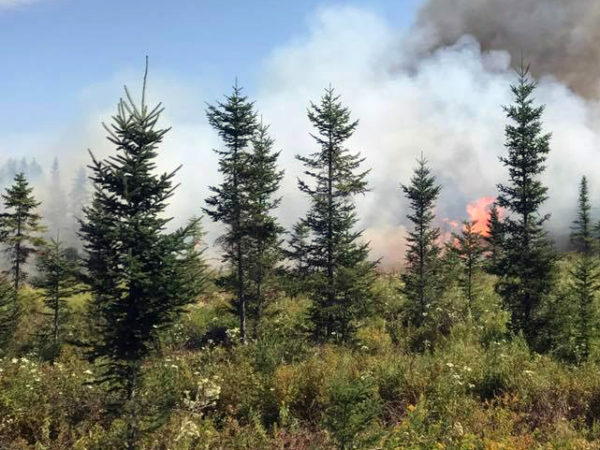 As of mid afternoon on Friday, Maine forest rangers and their mutual aid partners had been dealing with a forest fire in Columbia Falls that began on Thursday, as well as smaller fires that began Friday afternoon in Bucksport, Winterport and Warren. — About an about an acre burned in Bucksport off Silver Lake Road. District Ranger Peter Pelletier said the fire was extinguished by local firefighters and a ranger and that the cause remained under investigation. — A tree fell on a power line in Winterport near 985 North Main St. around 1:30 p.m. and burned about a tenth of an acre, Ranger Aaron Bailey said. As of around 4 p.m., Skillen was on his way to another possible wildfire in Woolwich, where a tree fell on a power line. Maine residents and visitors should check with their local fire departments or forestry office and obtain a permit before doing any burning.